Although the various adventuring parties have explored all of level 1 of the Caves of Woe at this point, I make a point to restock rooms when at least a few days have passed. Certain rooms the players avoided early on (thinking them to be traps) they came back to when their PCs were higher level. This is what happened in this session with a mysterious room whose floor was covered by a dense, purple mist. The party explored more of level 1 in this session, running into some wandering rock spiders, and burning alive a Worm of 1000 Cuts at the bottom of an earthen pit. They also recovered a golden ring (Ring of Archery) on a Dwarf skeleton tangled in vines with the clever use of a potion of plant control. 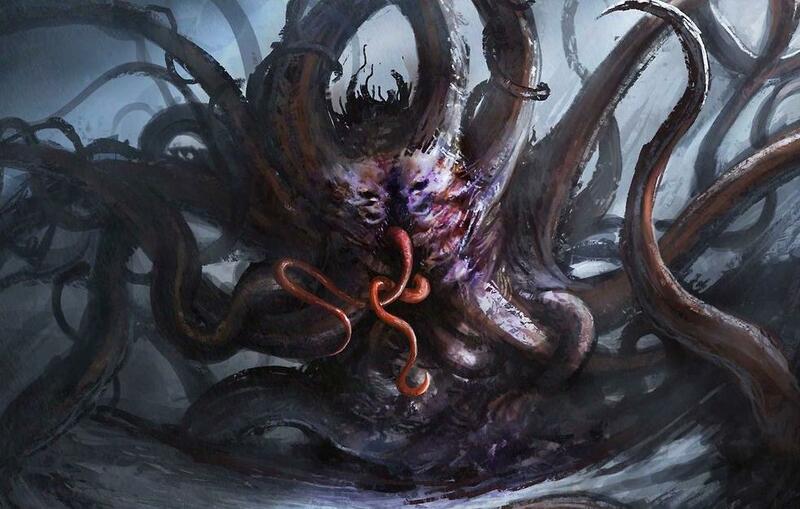 The trouble came in the purple mist room – actually filled 20 feet deep with cold water shrouded by a topmost layer of mist, and home to a tentacled horror. Garros discovered a narrow ledge on the edge of the room, leading to an opposing door. While trying to traverse it, he lost his balance and fell into the water, then frantically tried to jettison armor and equipment as he sunk below. Tentacles grabbed him, wounding him and pulling him to certain death, but he was saved in the end by M, who jumped in and cut through the tentacles holding him, then grabbed a rope thrown by Rozell. The party retreated to the caves entrance, warning Garros up with a fire and heading back to town.